What with baseball’s Code being all about respect, and what with the topic frequently having to do with showing players up (see, bat flips, pitcher gesticulations and even the occasional kiss), it’s easy to overlook that the players a guy shows up don’t have to be on the other team. Take Saturday’s game in Cleveland, for example. Lance McCullers, pitching for the Astros, had allowed runners at the corners with nobody out in the second, when Melky Cabrera smacked a ground ball right through first baseman Yuli Gurriel, playing in, for an error. McCullers did not take it well, showing visible frustration as he spun from the play, while screaming what looks on replay like an expletive. The right-hander didn’t think any more of it until after the inning, when, approaching the dugout, he stuck out his glove for an attaboy from Jose Altuve. Instead, Altuve swatted McCullers’ glove away, spiked his cap, and proceeded to give the 24-year-old an impromptu etiquette lesson, at volume. As it happens, ballplayers have a low tolerance for this kind of thing. The guy with perhaps the most pronounced reputation for such behavior is Hall of Famer Gaylord Perry, whose competitive instincts and take-no-prisoners attitude helped him win 314 big league games over 22 seasons. Those same attributes also helped alienate scores of teammates. The difference between Gamble’s story and others told about Perry in this context is that Gamble understood where the pitcher was coming from. In reviewing McCullers’ play, the broadcast crew referenced an incident that occurred between Derek Jeter and David Wells, but omitted many pertinent details. The play in question occurred in 1998, after Wells elicited a popup from Baltimore’s Danny Clyburn, which fell between Jeter and outfielders Ricky Ledee and Chad Curtis (the latter two players serving as defensive substitutes in a blowout). The Yankees already held a six-run lead, but that didn’t stop the pitcher from staring down the trio—all of whom had played the ball too tentatively—from aside the mound, hands on hips. Wells proceeded to give up three more singles, and was yanked from the game. It culminated a stretch in which he gave up 13 earned runs over 19.1 innings across three starts. Because Wells handled it expediently, and because he was a veteran on a veteran team, the slip-up did no lasting damage. Wells went on to win 18 games, and the Yankees won the World Series. Wells and Perry are hardly alone in their actions. Bob Gibson tells a story about throwing a fastball to Jim Pendleton of the Houston Colt .45’s during a game in 1962—not because he wanted to throw a fastball, but because Cardinals catcher Carl Sawatski demanded it, first by ignoring Gibson’s shake-offs, and then through a direct confrontation on the mound. Sawatski was 34 years old and a 10-year veteran, and Gibson, a decade younger, deferred to the veteran’s wisdom. Pendleton crushed the pitch deep over the left field wall. Gibson, who possessed one of the hardest edges major league baseball has ever known, immediately saw Sawatski’s point. Whether McCullers has it in him to make a similar adjustment has yet to be seen, but to judge by the pitcher’s comments after the Cleveland game, he’s well on his way. Being that the pitcher’s father, Lance McCullers Sr., himself played in the big leagues for seven seasons, Junior has a wealth of experience from which to draw. It’d be surprising if this was an issue again. 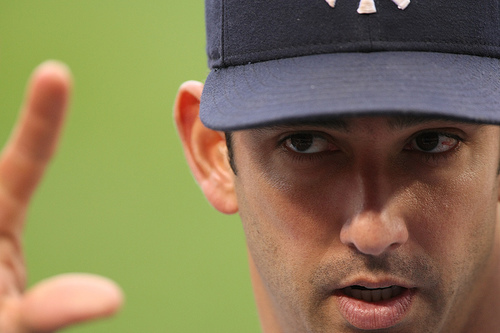 The most important factor in the Posada Madness pandemic that erupted over the weekend in New York is the ongoing viability of Jorge Posada—both as an everyday player or even somebody meritous of a roster spot. The big picture will likely be sorted out in short order. Aging and ineffective performers—even those as vital to their teams’ recent history as Posada—are rarely granted much leeway. Saturday night: Joe Girardi pencils Posada, New York’s designated hitter, into the No. 9 spot in the order—the first time the 39-year-old has been positioned so low since 1999. An hour or so before first pitch Posada asks out of the lineup. According to New Jersey Record columnist Bob Klapisch, Posada doesn’t explain himself, and Girardi doesen’t press him. Accounts differ about what is said, but multiple sources tell multiple media members that Posada feels insulted. The term “hissy fit” was used at least once to describe the encounter between player and manager. Considering when the request came—prior to a nationally televised game against the Red Sox—and who it came from—Girardi, a guy Posada has reportedly not much liked since their days together as co-catchers on the Yankees—perhaps this should not be surprising. Cashman intervenes, urging Posada to reconsider his decision. Posada does not reconsider. Cashman takes the audacious step of meeting with reporters in the press box during the game, to clarify that Posada is healthy, and that management has nothing to do with his absence from the game. With timing that one can only assume is in response to Cashman’s impromptu press conference, Posada’s wife, Laura, counters that claim, tweeting that Posada’s back is too stiff to play. The Yankees, in turn, decline to discipline their former star, who in the three games since has appeared only once, as a pinch-hitter. Ultimately, nobody came out looking too good. Girardi, by way of essentially staying out of it (Everybody needs a breather now and again, he told the press, rather than justifiably lighting into his catcher), is the least scathed. Posada and Cashman: not so much. Posada: An unwritten rule mandates that managers refrain from removing position players from the middle of innings except in cases of injury. The counter to this rule holds that players not remove themselves from the lineup while at the wrong end of a hissy fit. Big league clubhouses are rife with what is commonly referred to as a “warrior mentality.” The term isn’t particularly accurate in this case, in that warriors go to battle against opponents. In this case, Posada needed to be in the lineup to prove his allegiance, not his ability, to his teammates—not the Red Sox. For a veteran, a proven winner, to turn his back on his teammates in a key game for reasons that can only be construed as personal is inexcusable. Posada is no different than any other ballplayer in this regard; his ego will never be as important as the success of his team. His teammates know it, and his position in the clubhouse hierarchy depends upon it. A reader asked how Posada’s move compares to Cal Ripken removing himself from the Orioles’ lineup in 1998. Ripken was, like Posada, in the late stages of his career. Ripken’s consecutive-games streak had grown so mountainous by that point that it trumped any move manager Ray Miller could have made that involved his star shortstop spending a game on the bench. Ripken was hampering himself and his team by staying in the lineup every day. He ended his streak for the greater good, and was lauded for it. Whether or not the captain actually believes this is incidental. Perhaps he’s sticking up for Posada because that’s what teammates do, but it’s hard to imagine that Jeter picturing his own neck on the chopping block didn’t play a part. Cashman: The guy is a veteran, and no matter how well he does his job, he probably puts up with more grief from the New York media than the next several most second-guessed GMs combined. He, of all people, should understand the machinations of communication in the big leagues, and that going through the media for any of it rarely turns out well. On one hand, Cashman’s method of delivery added layers of importance and urgency to his message. Short of suspending Posada or releasing him outright (both of which would have brought their own headaches), there was no less equivocal way for Cashman to inform the veteran that he was not messing around. That has to be a particularly difficult place to inhabit, especially when it comes to icons like Posada and Jeter, and Cashman is taking a hard-line approach. (Telling Jeter to test the waters during off-season contract negotiations was a clear step in this direction.) To do it the way he did it, however—not just publicly, but in a manner so unusual that the delivery itself brought attention, independent of the message delivered—was to ignore the service and success that Posada has given the organization over the last 17 years. Ultimately, Posada’s actions amounted to nothing more than a really bad day. Holding him accountable is reasonable. Benching him for lack of production is also reasonable. From a baseball (if not contractual) standpoint, giving him his outright release would be entirely justified. Taking it public like Cashman did serves only one purpose. It tells the rest of the aging roster—Jeter in particular—that when it’s time to go, they better not mess around. Time will tell if the ends were worth the means, but as of right now it’s not looking too good. Josh Hamilton clearly was not happy with the way things went Tuesday. With Hamilton on third, third base coach Dave Anderson noticed that nobody was covering the plate as Tigers catcher Victor Martinez went to chase a popup that was ultimately caught in front of the Tigers dugout by Brandon Inge. 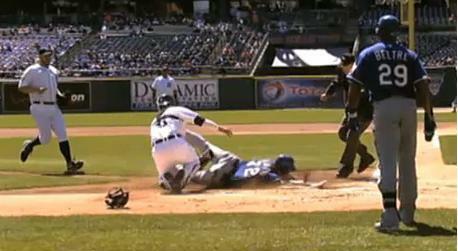 Anderson urged Hamilton to score, but Inge flipped the ball to Martinez, who beat a diving Hamilton to the plate. The result: a broken arm and six to eight weeks on the disabled list. Hamilton was out, he was injured and he was frustrated. And he let it get to him, lashing out at Anderson after the game, essentially blaming his coach for the injury. Hamilton is allowed to take issue Anderson’s call, personally or directly to Anderson. What he’s not allowed is to call out a coach in public. It undermines every bit of authority Anderson possesses. This doesn’t happen frequently, but it’s not it’s never happened before. In 1986, for example, Angels baserunner Bobby Grich, having rounded third on a single by Bob Boone, retreated to the base, only to be thrown out by a relay from Jim Rice to Wade Boggs to Spike Owen. The Angels were trailing 3-2; Grich would have been the tying run, had he scored. He threw his helmet to the ground and animatedly gestured toward third base coach Moose Stubing, showing him up not just in word, as Hamilton did to Anderson, but in deed. Afterward, Stubing accepted full responsibility for the blown play, but that’s almost beside the point. No matter how badly he failed at his job, the unwritten rules mandate respect from player to coach, and vice versa—especially on the field. It’s the same section of Code that keeps managers from removing position players in the middle of an inning for anything but injury. It took some time for Grich to understand this, but after the game he tracked down his coach to apologize. Never mind the fact that Hamilton’s status in the game is lofty enough to allow him to do whatever his instincts tell him on the field. He would not have been second-guessed for staying at third, no matter what happened. Also never mind the fact that players are taught to go feet-first when sliding into home. Later that same afternoon, however, the slugger had either reconsidered his stance, or had been instructed in no uncertain terms to turn the other cheek. Finally, he apologized to Anderson.